It’s trendy to extoll the virtues of single malts. But dismissing the craft of blending whiskey would mean you’d miss out on such gems as High West’s Campfire Whiskey – a wonderfully tasty blend of Scotch, bourbon and rye whiskies. The Utah based High West Distillery has been blending whiskies for years – including some outstanding rye and bourbon blends. The company’s Campfire whiskey takes the blending to a new level by bringing together Scotch, bourbon and rye to create an unusual, distinctive and outstanding expression. High West doesn’t list out the whiskies used to craft Campfire, but they do note the bourbon is 75% corn, the rye is 95% rye, and the Scotch is a peated malt NOT from Islay. All of the whiskies are at least five years old. The result is a blend that brings out the sweetness of the bourbon, the spiciness of the rye and the smokiness of the Scotch. Our tasters had a great time with this expression, several marveling at the delicate complexity. In fact, I think ‘delicate’ and ‘complex’ were the terms best described High West’s Campfire Whiskey. From the nose to the finish, there’s just an amazing mix of smoke, peat, fruitiness and spice. But the surprising thing is that no element really overwhelms the others. It’s just a perfect balance – right to the end – which is long, sweet, spicy, and smoky. 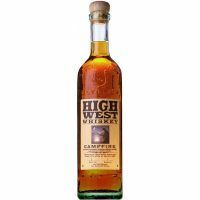 I recommend High West Whiskey Campfire neat. The folks at High West tout Campfire as the perfect whiskey for your next Manhattan. A bottle will run about $50.